Logre Primary School’s headteacher Solomon and Mondo teacher Prosper decided to organize the food project one day before the annual Farmer’s day. This is a public holiday in Ghana and celebrated every first Friday in December, this year on 4th of December. This day is a vacation day for all workers and the whole public sector, a day off to enjoy literally the fruits of their own input. The best farmers and fishermen are nominated for prizes and they receive high recognition. The first best farmer received two machetes, a pair of Wellington boots and a preset radio (GraphicOnline), but nowadays the prizes are bigger and bigger. In 2015 the winner was entitled to a house and also took home a huge sum of money, a laptop and a car (Ghanaweb). Every year the celebrations take place in a different region and city. This year it was special, because the 31st National Farmers’ Day celebration took place in Upper East region (UER) in Bolgatanga which is the closest bigger city to Kongo village. The theme of 2015 was Transform Ghana – Invest in Agriculture and almost 78 people were honored altogether (Ghanaweb). Bolgatanga is the town where Solomon lives and all Kongo was talking about the big event. The prominent people and elders were all invited to attend the celebrations. The positive side of having the event carried out in Bolga was that the whole country turned their eyes towards their region. Upper East is the poorest of regions where the nature is the most severe and the famine and lack of education is the most prominent. However this was their occasion to show the hospitality of the locals and their warm hearts and positive assets. The UER exposed the people of coming in to the agricultural potentials of the region and farmers got well informed about the eco-system, soil types as well as the weather and climatic conditions of the region. The winner of 2015 pointed out the hospitable nature of the people commending them for their religious tolerance. (GraphicOnline) This is one of the aspects one could really feel coming to Bolga, Kongo or Logre site. The period that Logre organized their food project was already the Harmattan season. The most flourishing rainy season came to end at the end of October, in November the surrounding sites started to dry up. In December it is when the crops really start to lack and the famine sets in. The Harmattan is a dry, dusty strong wind that blows from the Sahara from December to February. It appears like fog but it is dust and the dust is so dense that it covers the sun. Some people could even describe it as pleasant because the small particles of sand dims down the heat coming from the sun. But for the locals it causes problems from drying the land completely to drying themselves: skins starts cracking and people suffer from occasional and sudden nose bleeds. Shea butter is the best moisturizer for dried skin and lips. (Easytrackgahan) Remind yourself how Sekoti Primary School prepared shea butter last year. In 2015 the Harmattan started to unusually early.This is one of the consequences of the climate change. The result? The farmers are fearing that the Harmattan could dry up cocoa seedlings but Ghana is one of the two biggest cocoa producers in the world. So due to Harmattan, it was rather difficult for the school to organize a preparing of the food or show the harvesting. They idea was to show the readers of the foodblog the local culture through some farming songs. The first step is that the group headed to the garden of the PTA chairman Mister Naab Dok. His family was planting pito (vegetable used not only to produce local alcoholic drink but the leaves are also used as vegetable in soups and stews) and tomatoes, even his smallest children were at the site with parents. The garden was small but lovely, the had used millet sticks to fence it and protect from wild animals. On the way there we could really feel the Harmattan blowing. The headteacher was even about to cancel the event in fear of having bad audio quality and visibility. We still carried the project out in order to honor the preparation work the pupils had done but sorry for any inconvenience the sound may cause. Still, the picture depicts well the seasonal aspects. The pupils were grouped by their duties, some of them were planting, some carrying water and watering, some accompanied with singing to keep up the good moral and the rhythm. Afterwards the group came together and started dancing to celebrate the end of work. The headteacher translated the songs sung by the children. They were manly about honoring the works the parents do (the parts of all the participating pupils are farmers). Children need to respect the family and help out with farming activities. Sadly, it often implies skipping school for days do to the planting or the harvesting. Still, having food on the table is the second most important thing to survive after having clean water to drink. As in the Northern part of Ghana the farming can only been done when the water is present, during the rainy season, parents are looking out for alternative ways of providing for their families. So the often crack stones or go mining gold to earn their living. The translations of the songs and the seasonal aspect of farming is also explained by the headteacher. Watch our slideshow about how we make rye bread in Estonia in Tsirguliina Secondary School! Read all the posts by Tsirguliina Secondary School. Read all the post by students from Estonia. 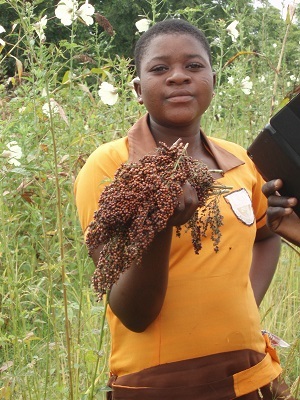 Two teachers and ten students from Presentation Junior High School have done a great and useful work: cultivation of the late millet, the whole process from the beginning to the end, from preparing the land for sowing to eating TZ made from millet flour. Millet’s high protein content (15 percent) makes it a substantial addition to a vegetarian diet. Millet is an important food crop in Northern part of Ghana and Northern, Upper West and Upper East (where Logre village belongs) Regions produce 90 per cent Ghana’s millet. The typical Ghanaian staple foods in the northern part include millet. Watch useful and educative 3-minute overview with photos and explanations about the cultivation of late millet at Logre stages. And also longer video about the process. Special thanks to Presentation Junior High School students, teacher Derrick Adongo who instructed the students and was a patron of this food project, and camera-man, ICT-teacher Justice Pelig-bagre for the wonderful work! Hope the readers will appreciate it too! Read all the posts by Presentation Junior High School. Read all the post by students from Ghana. Dasabligo is a farming community in the Nabdam district in the Upper East region in Ghana, West Africa. There are many crops that grow in Ghana. They include cocoa, coffee, yam, rice, maize, guinea corn, soya beans, groundnuts etc – most of these crops are annual crops. The premier crops are mostly grown around the southern part of the country where regular rainfall appears throughout the year. Upper East region, Bolgatanga (where Dasabligo community is located), grows annual crops due to the parthera of rainfall at this part of the country. Among these annual crops grown in the east region include guinea corn, groundnuts, rice, maize, soya beans, beans, sweet potato etc. 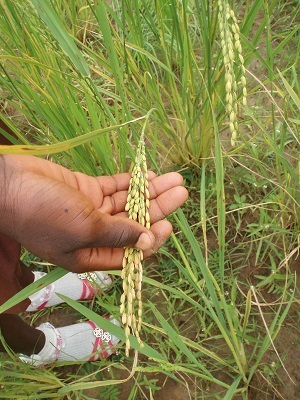 Among these crops: maize, rice, guinea corn and groundnuts are grown in our community, Dasabligo. Maize, rice, guinea corn are classified as cereal crops while groundnut is a leguminous crop. This makes it possible for us to practice mixed cropping in our community. That is when the cereal crops can be grown with groundnuts. Below are the crops that we grow, how they are cultivated and how we make food out of them. The botanical or scientific name of maize is Zea mays. It becomes the family of Crambidae. There are many varieties of maize in Ghana. Among them are local varieties or land race, synthetic varieties e.g. Dobidy, Aburotia, Bafia. We the people of Dasabligo grow the local (variety): Abelechi. Maize likes rich soil with good drainage. Ideal soil for maize is sandy loam that stays moist without being too wet. Usually animals dropping are used as fertilizer. Rainfall between 600 mm and 900 mm during the growing season is necessary as well. Propagation is done by seeds which are done manually by sticks or cutlass. The seeds are space 90 X 30 cm , 75 X 40 cm for the Abelechi variety. Two-three seeds are put per hole and germination occurs after four to seven days. Seeds that have not germinated should be replaced. Weeding is done manually by hoe or cutlass at regular depending on the weed on the farm. Maize mature between three to four months (90-120 days). 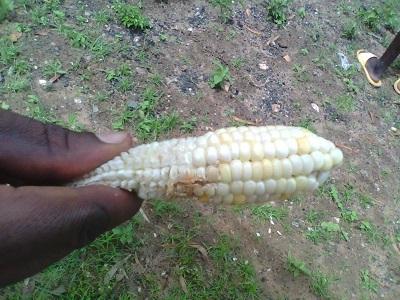 Maize can be eaten either boiled or roasted. It can also be processed into flour, corn flakes, use for beer, baking flour. The flour can be used preparing TZ, banku and kenkey with soup or tomato stew. It botanical name is Sorghum bicolor. There are many varieties of guinea corn; among them are Gambaga type Nunaba type, Naga White, Naga Red and the Belko type. The varieties grow in our community are the Naga Red and Naga White. Guinea corn grows well in soils with high humus and well drained. Optimum temperature for growth is 27 °C but can bear extreme heat better than most crops. The seeds are usually used for propagation. Recommended spacing is 75 X 15 cm. Guinea corn responds favourably to fertilizer application. For inorganic fertilizer we apply NPK 4°: 40: 10 In split closes. Half at sowing and half four weeks later The main diseases that attack guinea corn are rust and loaf spot and they can be controlled by crop rotation. Guinea corn are used for preparing TZ, local alcohol known as pito and also for preparing porridge. Groundnut is a dual-purpose crop. It can be cultivated as oil crop as well as leguminous crop. But it is mainly grown for its oil. Its botanical name is Arachis hypogea. The nut (seed) contains 40-50% oil, 30% protein and 18% carbohydrates. The oil is used sor making margarines, cooking, soup and salad oil. The residue after the oil extraction is used as groundnut cake. There are two main varieties. The bunch type and the runner or spreading type. Both two varieties grow well in rich, sandy loam soil. The soil must be rich in calcium and phosphorus to ensure good pods formation. Optimum rainfall ranges from 500 mm to 1000 mm per year but it can tolerate rainfall as low as 200 mm. Groundnut requires a lot of sunshine and high temperature. It does not like shade or cloudy weather. Propagation: this is by seed. It can be planted solely or inter-cropped with other crops. One seed is planted per hole; spacing is 45-60 cm between rows and loam within rows for erect type. Seed should be dressed with fungicide before sowing. Weeds are controlled by manual means with the hoe or cutlass or by used of weedicides. Weeding manually should be done twice before flowering. Fertilizer application usually in Dasabligo here, organic manure is used at the time of planting. But after planting nitrogen fertilizer can be applied. The erect type clearly maturing matures in 90-100 days while the spreading type matures in 120-150 days. Harvesting is done by using hoe or pulling the plant by hand when the ground is wet. After harvesting the pods are dried and stored in silos or in bags either shelled or unshelled. The most common groundnut disease in Dasabligo is groundnut rosette diseases. It usually causes the green leaves to turn yellow and mottled. Plant becomes stunted and finally dies. Pests like rodents which include rats dig up and eat sown seeds. 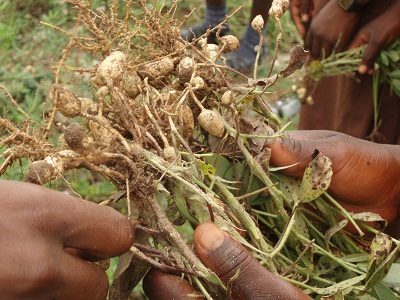 The groundnut rosette disease is usually controlled by uprooting and destroying affected plants. The rodents are controlled by touching and trapping them. Watch our short video with music too!